2017 Leaf Autographed Football Helmet may not easily fit in a pocket like a pack of cards, but the concept is fundamentally the same. Housed inside every box is a signed football helmet, but the signer remains a mystery until the seal is breached. If the idea sounds familiar, it's because Leaf has produced similar products for years. Signed on officially-licensed, replica NFL helmets, the 2017 Leaf Autographed Football Helmet checklist is not confined to one period of football. Instead, collectors can find a diverse assortment that covers Hall of Fame players as well as those who still suit up every Sunday. 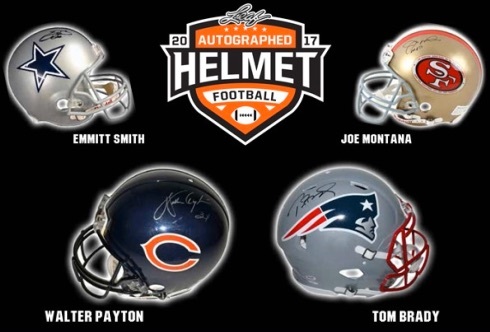 The highlights from 2017 Leaf Autographed Football Helmet include some big names like Brady and Montana. An early list is provided below but this is not the entire checklist of possible subjects. In addition, the packaging format sees a slight change, increasing to four helmets per case compared to three in the 2016 release. While 2017 Leaf Autographed Football Helmet involves full-size helmets, Leaf also offers a version featuring mini-helmets. 2017 Leaf Autographed Football Mini Helmet Blind Box Brand new sealed.